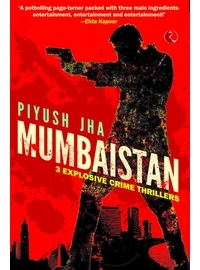 The Blurb Of the Book Says: Mumbaistans three explosive crime novellas unravel the secrets of maximum city from the slums of Dharavi and the bylanes of Kamathipura to the swank high-rises of Bandra. A prostitute, her lover and a policeman play for high stakes in BombDay. Injectionwala exposes chilling medical malpractices and a lovelorn vigilantes twisted game plan. In Coma Man, a man awakens from coma after twenty years, and sets out in search of his wife and himself. Gritty love stories, manipulative cops and hard-boiled slumlords form the backdrop of this unputdownable thriller. Its MUMBAISTAN all the way. Piyush Jha is an acclaimed film director, ad filmmaker and a first-time novelist. A student political leader at university, he pursued a career in advertising management later acquiring an MBA degree. Later, he switched tracks, first to make commercials for some of the countrys largest brands, and then write and direct feature films. His films include Chalo America, King of Bollywood and Sikandar. He lives in his beloved Mumbai, where he can often be found walking the streets that inspire his stories. One of the unexplored genre in Indian Fiction writing is Crime Fiction. Mumbaistan by Piyush Jha fills in the void quite well. Piyush Jha, a filmmaker turning into a novelist, spins three crime tales in one single book. Bomb Bay, Injectionwala and Coma Man – each of which succeeds, though at different levels, in turning out to be really interesting reads. While the start is good and the middle portions are attention grabbing, what makes ‘Bomb Day’ the story that it eventually is the stunning climax that one simply can’t see coming. At the cost of even a hint turning out to be a spoiler, I would suggest you just go ahead and read the tale in one go. Though the book has been put into the category of “crime fiction”, the locations are real, the facts about cops,prostitution,corruption,crime etc. are real and ultimately when you start reading the book, the stories also seem to be real!! The best part of this book is the story telling and the descriptive way it has been portrayed. The quality of the book in terms of the Cover Design and Printing is a good bargain for the price mentioned not to forget the Three Crime Stories well documented by Piyush Jha. I personally feel that the Acknowledgement Part should be on the beginning of the book but Mumbaistan, by Piyush Jha has made me think over this.